There is a substantial gap from the time new knowledge is created to when it is put into practice. The field of Knowledge Translation (KT) has emerged as a response to this gap. KT involves interaction between knowledge users and knowledge producers and results in mutual planning, producing, disseminating and applying existing or new knowledge to enhance the health of Canadians. 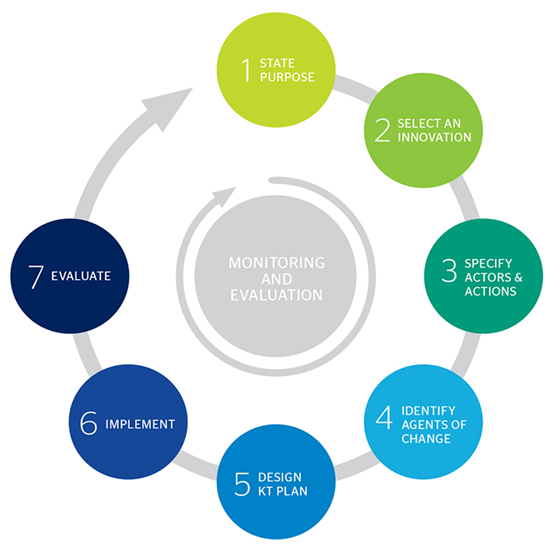 The Innovation to Implementation (I2I) guide is a how-to resource for driving change using KT activities. The guide illustrates how to move from innovation to implementation in a thoughtful manner to achieve the desired outcomes of a project or initiative. The I2I guide explains the purpose of each step to achieving successful KT, walks participants through a series of guided questions, and provides helpful tips. By completing this guide, participants will not only have implemented and evaluated a sophisticated KT plan, but will also have created new knowledge. In addition to the how-to resource, a free online course is available to help participants understand and use the 7 steps of the I2I in their KT work. The course can be completed in less than 20 minutes, over multiple sessions. Please click here to access the course.